instructions as modified by these Sailing instructions. the LTYC/FRMEA Club House, Fort Taber Park, New Bedford, MA. 11:45 am. In the vicinity of the starting mark. 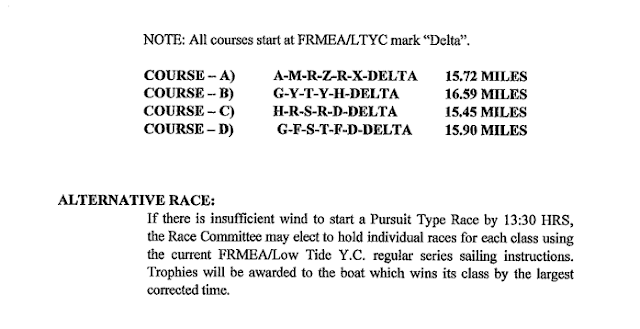 Start will be at the Delta Mark. Southeast of the Butler Flats Light House. displayed until one minute before the starting sequence begins. SECOND LINE: Delay in minutes from 12:00 noon start. channel 69 and shall acknowledge any calls directed to them individually. Start times are GPS times from the scratch sheet. finish protester shall notify RC of its intent to protest on CH 69. First Place awards will be awarded in all classes sailed. The John B.
each class will determine 2nd & 3rd Place awards. and distance to other marks of the course.